Crispy Fry®, the country’s number one breading mix brand, hosted the #CrispyFryPlayDay to introduce its newest product, Crispy Fry® Shake! Shake! Shake!, to a new generation of parents and kids last February 24, 2018 at Trampoline Park. An exciting alternative to the usual sit-down press gathering, #CrispyFryPlayDay also provided an opportunity for members of the media to make it a more involved family affair. Together with their kids and loved ones, guests gamely jumped into the giant foam pit, played trampoline-style basketball, and learned free jump techniques. Participants were introduced to Crispy Fry® Shake! Shake! Shake!® which puts an exciting twist to the family’s favorite Crispy Fry® fried chicken with the addition of three new flavor mixes: Parmesan Cheese, Smokey Barbecue, and Savory Seaweed. 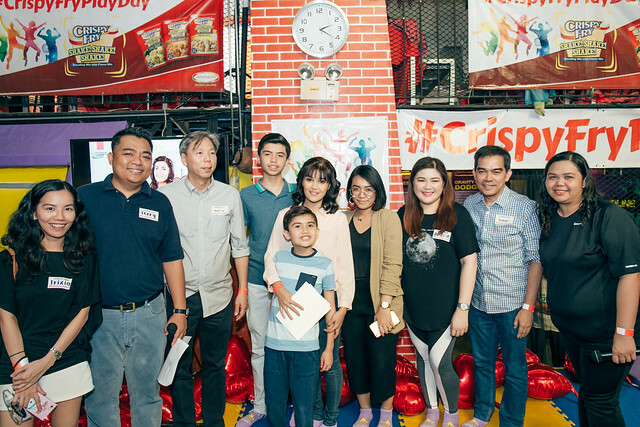 Crispy Fry® celebrity endorser, Donna Cruz-Larrazabal, brought along her young sons – Cian and Gio – to join in on the fun as well. For the Cebu-based actress-singer, wife, and mom, events like #CrispyFryPlayDay are one of the many ways she and her husband can spend time with their three kids amidst school activities and work schedules. With jump time over, guests were treated to a cooking demonstration of the signature Crispy Fry® fried chicken wings in Parmesan Cheese by Ajinomoto’s resident chef, Jeffrey Chang. Sofia Conejos, Culinary Networking and Communication Manager of Ajinomoto, also gave helpful tips on how to deal with kids who are picky eaters. As a licensed nutritionist-dietitian, she emphasized the need to include nutritious food in their kids’ diets in any way parents can. It can be as simple as involving them in the cooking process and serving vegetables alongside their favorite fried dishes. As the #CrispyFryPlayDay came to a close, media friends and their families went home with happy hearts and tummies – a satisfying end to what was a fun-filled day. For more information, “like” facebook.com/CookmunitybyAjinomotoPH and visit http://www.ajinomoto.com.ph. 1 pack of CRISPY FRY® Shake! Shake! Shake! DEFROST 1 kilo chicken in running water and drain excess water. COAT. Spread contents of Crispy Fry® Breading Mix packet (use 1 packet for every 1 kilo of chicken) and generously coat chicken one at a time. FRY and DRY. Put oil in cooking pan and heat until 350 °F (use 1 liter oil for every 1 kilo of chicken). Place 6 pieces of chicken skin-up and cook for 5 minutes per side. Set aside cooked chicken in cooling rack and let it cool for 10 minutes. SHAKE! SHAKE! SHAKE! Put 1 kilo chicken inside paper bag, open and pour flavor packet evenly inside paper bag (use 1 flavor packet for every 1 kilo of chicken). Make 2 folds down the opening of paper bag, leaving some air inside and give the bag a few shakes to spread out the flavor seasoning. Frying tip: Limit cooking oil to 1/3 of frying pan and re-use cooking oil only up to 2 times. Cooking tip: Instead of using the usual chicken cuts, chop deboned chicken thigh into 6-7 pieces to make chicken poppers or slice chicken breast into strips to make chicken tenders. 1) breading mix packet, 2) flavor mix packet and 3) shaker bag.